Welcome to the Bomber Command Commemorative Day’s Website. This site is managed by the Bomber Command Association in Australia Inc. It was set up as the official site for Commemorative events. 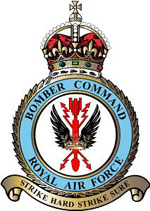 Under the umbrella of the Bomber Command Association in Australia a sub-committee was established in 2007 to initiate memorial ceremonies in all states of Australia as well as the United Kingdom, New Zealand and Canada. The committee is known as the Bomber Command Commemorative Day Foundation. This initiative has been very successful with committees working either independently or with RAAFA personnel to mount ceremonies in each state. The NSW ceremony is organised by the Bomber Command Association in Australia. The Wreathlaying Ceremony, held in Canberra each year on the first Sunday in June, now ranks as the third most attended ceremony at the Australian War Memorial, after ANZAC Day and Remembrance Day. Highlights will be the 10th year of Commemorative Ceremonies ….also celebrating the 75th Anniversary of Australian Squadrons in Bomber Command.